Ticonderoga, NY – June 22, 2017 - The Ticonderoga Montcalm Street Partnership (TMSP) is pleased to announce that they will host the 9th Annual StreetFest in Historic Downtown Ticonderoga on Saturday, July 29, 2017 from 10:00 AM to 3:00 PM. The 2017 StreetFest will include shopping, sidewalk sales, non-stop live entertainment, arts and crafts, variety of vendors, food, Farmers’ Market, fun, Star Trek Original Series Set Tour, and a variety of kid’s activities. Admission to the event is free and open to the public. Nominal fees may apply for some activities. “StreetFest was designed as an annual event to attract people to Ticonderoga&apos;s historic Montcalm Street district. Montcalm Street (from Sunshine Laundry to Glens Falls National Bank) will be converted into a pedestrian mall open to the public. StreetFest is a “must do” event for area residents and visitors alike. StreetFest continues to grow every year and will be even bigger and better this year. You will not want to miss this event featuring live music all day, wonderful kids activities, sales, and much more. The Ticonderoga Area Farmers’ Market will join StreetFest on July 29th as well and will offer local produce, products, and more throughout the day,” Bob Dedrick – StreetFest Committee Chairperson. Fort Ticonderoga Fife & Drum Corps, led by Mike Edson from 10:00 – 10:30 AM. The Fort Fife & Drum Corp will be joined by visiting corps who are participating in Fort Ticonderoga’s annual muster. All corps will march down Montcalm Street performing individually then as a collective unit in front of Glens Falls National Bank. The list of corps will be announced on the TMSP facebook page. 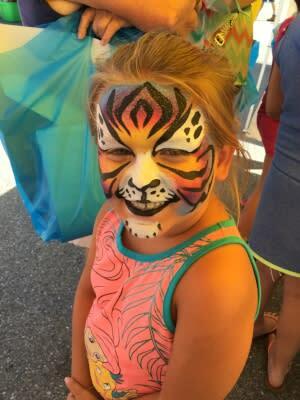 Kids activities for StreetFest will include professional full face art, face painting, balloons, & balloon animals by Penelope The Clown (sponsored by the Ticonderoga Federal Credit Union), caricatures, Pirate themed game station (sponsored by Lakeside Regional Church), and horse drawn wagon rides behind the downtown business district (sponsored by Gin’s Redemption Center), and more. “We invite the community, area visitors, businesses and vendors to join us for the 9th Annual StreetFest. A great lineup of live music and entertainment is planned for the 2017 StreetFest. We encourage area residents and visitors to come and spend the day with us. Not only will there be amazing live music throughout the day, but there will be a variety of food, merchant sidewalk sales, vendors, and activities. You do not want to miss this event in Downtown Ticonderoga. We encourage you to support local merchants during StreetFest and throughout the year. Take this opportunity to see all they have to offer,” shared Matthew Courtright – TMSP Coordinator. Merchants and Vendors still have time to sign up for StreetFest. Registration forms are available at the Ticonderoga Area Chamber of Commerce (TMSP Coordinator) office located at 94 Montcalm Street, Suite 1 in Downtown Ticonderoga. The deadline to register is Wednesday, July 19th at 4:00 PM. Forms can also be found at www.timainstreet.org. For vendors arriving, Montcalm Street from Glens Falls National Bank to Sunshine Laundry will be one way traffic (entering near Glens Falls National Bank) as vendors and merchants set up for the event. Vendors cannot arrive until 8:00 AM and cannot break down until 3:00 PM. Maps labeling locations of merchants, vendors, food, music, fresh produce, activities, and more will be available as guests enter Downtown Ticonderoga and are welcomed to StreetFest as well as at the Ticonderoga Area Chamber of Commerce. In addition the program will include the schedule of music and entertainment. StreetFest Ambassadors who will be happy to assist you during the event will be wearing yellow StreetFest t-shirts. Montcalm Street will close to traffic between Lake George and Champlain Avenue from 6:30 AM to 4:00 PM. All parked cars should be removed by 6:00 AM, prior to the street closure. For more information on StreetFest contact the Ticonderoga Montcalm Street Partnership (TACC – TMSP Coordinator) at 518-585-6619 or visit www.timainstreet.org. Also check out the the Ticonderoga Montcalm Street Partnership facebook page to stay up to date with news and events. Ticonderoga Montcalm Street Partnership - The Ticonderoga Montcalm Street Partnership (TMSP) is a not-for-profit 501 (c) (3) organization. Its mission is to create and enhance the economic, historic and social development of Ticonderoga&apos;s traditional business district, employing the National Trust Main Street Center&apos;s guidelines for organization, design, promotion and economic restructuring. Meetings are held monthly and volunteers are always welcome. Like the Ticonderoga Montcalm Street Partnership on facebook to stay up to date on TMSP events, news and more. For more information on the TMSP visit www.timainstreet.org.